Monmouth County Historical Association’s Family Day - November 25, 2016 ~ The History Girl! Monmouth County Historical Association’s museum at 70 Court Street will hold a special Family Day on Friday, November 25, 2016 from 10:00 am - 4:00 pm. 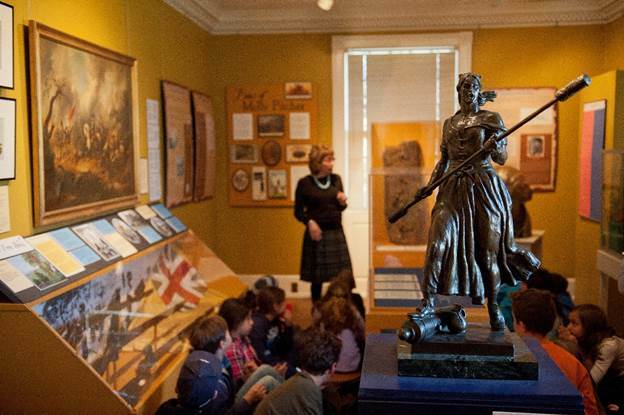 Spend time with your family with museum activities and learn about our shared history. In the morning, visit our Battle of Monmouth exhibition, That Memorable Sabbath-day: The Battle of Monmouth in Drawings, Paintings & Prints, and join in activities such as a scavenger hunt, drawing your pictures of the infamous battle, finding Molly Pitcher throughout the exhibition, and touching artifacts from the battlefield. In the afternoon, there will be a showing of “The Tigger Movie” at 1:00 pm. In this 75 minute movie, Tigger tries to find out about his family history and searches for other Tiggers. After the movie, create your own family tree and visit our latest exhibition about a Monmouth County family who has lived here for almost 300 years – Hartshorne: Eight Generations and Their Highlands Estate Called Portland. This exhibition tells the story of the Hartshorne family through many never before displayed documents, artifacts, paintings, textiles, silver, and furniture. Activities and movie are included with admission. Free for members, $5 for adults, $2.50 for students and seniors, and children under 6 are free. Monmouth County Historical Association is a private non-profit organization that has been working to preserve history and provide educational opportunities since its founding in 1898. The Historical Association’s Museum and Library is located at 70 Court Street in Freehold, NJ. Museum hours are: Tuesdays - Saturdays 10:00 am to 4:00 pm. The Library is open Wednesdays through Saturdays. The Historic House museums are open Fridays, Saturdays and Sundays, from May 1 through September 30, 1:00 pm to 4:00 pm. For further information about the Association, call 732-462-1466 or visit www.monmouthhistory.org.